After eight years heading eateries in Louisiana, Mitch Arens returns home to oversee food and beverage operations at Hotel Covington. You’ve cooked in Cajun Country. I definitely have a strong passion for Southern food. That’s why I moved to Louisiana. I wanted to experience that culture and learn it from the people. What role does Cajun play at Hotel Covington? We didn’t want Coppin’s to be identified as a Cajun restaurant by any means. 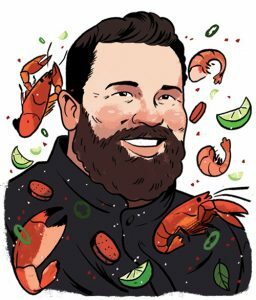 It’s more about the concept of Cajun food…entertaining the story behind your food and where it came from and the collaboration with local people. We’re taking Southern dishes and incorporating local ingredients. How do you incorporate Louisiana culture? One way is by doing more events on our patio. Crawfish boils and shrimp boils really speak to that Southern, Cajun tradition. It’s rubbing elbows with the person next to you, even though you don’t know them, while you’re eating boiled shrimp or crawfish. What’s your vision for Hotel Covington? We’re in a hotel, but we don’t consider ourselves a hotel restaurant. We’re a great restaurant that has rooms above it for people to stay in. We want to really focus on the locals and make sure they constantly have things to try. Any sort of variety that we can give people so that they can come in several times a week and have different experiences every time.